Aoraki Mount Cook is New Zealand's highest mountain peak, at 3754 meters. It is also the focal point for Aoraki Mount Cook National Park. This part of south W​estland in the South Island of New Zealand is part of the UNESCO Heritage area of and is a wonderful alpine area to discover. Nestled deep within the Southern Alps mountain range, there are 20 mountain peaks more than 3050 meters high and literally, thousands of glaciers (including the Franz Josef, Fox and Tasman glaciers), making this one of the most dramatic alpine regions in the world. The closest settlement to Mount Cook, and the best base from which to explore the area is Mount Cook Village. It is a dramatic and lovely spot and offers a whole range of things to see and do. Mount Cook Village is situated approximately 200 miles (322 kilometers) south of Christchurch, on the route to Queenstown. To get there, leave the main highway at Lake Pukaki, the next lake south after Lake Tekapo (the turnoff is well signposted). The village is another 30 miles (50 kilometers) along the road, mainly following the shoreline of Lake Pukaki. This is the only road into the village, so leaving means retracing your steps. All the way along the road the imposing sight of Mount Cook and surrounding tall peaks of the Southern Alps are seen in the distance. The drive along here is especially memorable for the mountain scenery. Mount Cook Village sits to the south of the mountain range, near the Tasman Glacier as it falls into Lake Pukaki. This is a small and isolated village. However, the facilities, although limited, cater for every type of traveler, from budget to luxury. Walking, hiking and tramping. Walks can last from less than an hour to several days. Drive a short distance from the village and there are more walks, including a walking trail to the Tasman glacier lake. Scenic flights (including glacier landings). Probably one of the most memorable experiences in New Zealand is a flight by helicopter or small plane through the Southern Alps with a landing on one of the glaciers. Stargazing. With some of the clearest night skies in the country, this is the perfect place to marvel at the night sky. The Hermitage hotel organizes a nightly stargazing event (weather permitting). There are only a few places to stay in the Mount Cook Village so in the busy seasons (especially the New Zealand school holidays and from February to April) it pays to book ahead. The most prominent accommodation is the luxurious five-star Hermitage Hotel. In addition to luxury rooms, the hotel also offers chalets and motel units, ideal for families or groups. Aside from the hotel, there are three backpackers lodges and a couple of camping areas (including a camping ground). Eating options are also very limited. There are no supermarkets or convenience stores so all food must either be bought from one of the local restaurants or brought in with you. The Hermitage Hotel has three restaurants which are variously fine dining, buffet, and casual cafe-style food. The only other place to eat is the Old Mountaineer's Cafe, Bar, and Restaurant, located right behind the Visitor Center. This is open for breakfast, lunch, and dinner and has a nice atmosphere with (as the name suggests) a mountaineering theme. All four of these restaurants are located to take advantage of the wonderful mountain views. 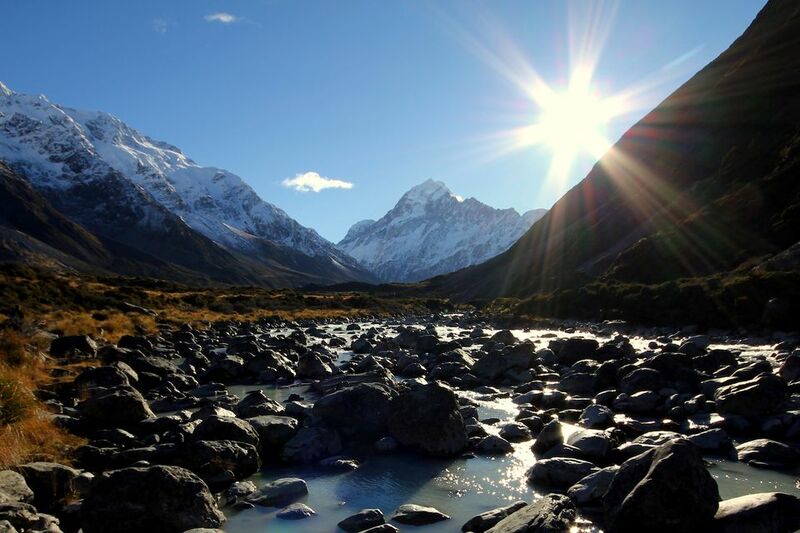 Catching the final rays of sunlight on Mount Cook while dining here is a truly memorable experience. As this is an alpine environment the weather can be extremely changeable. Unfortunately, it is not uncommon to spend one or two days at Mount Cook and not get a proper view of the mountain at all due to the covering of clouds and mist. Nevertheless, every time of year offers something different for the visitor. Winters are cold and crisp while the summer can be warm during the day and cool at night. Any time of the year is a good time to visit, although the walking is much easier in the summer (and therefore more popular). Spring is one of the nicest times, with alpine flowers creating a profusion of color.